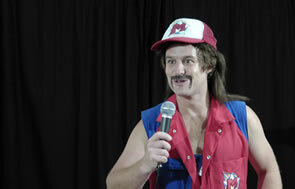 The fictional creation of Julian Bell, Ernest the Magnifico has been a festival favourite around the world since 2007. 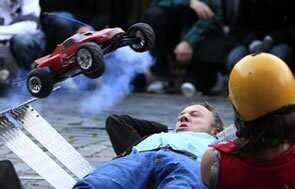 A regular on the European, Canadian, and Australian festival scene, he has performed in Street Theatre festivals, Fringe and Arts festivals as well as Fairs, Fétes and Car themed events. 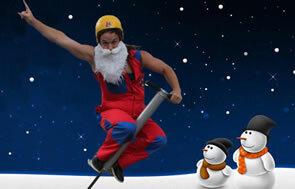 Ernest's 'Rockin Stuntshow' combines a loveable character with unique and comic stunts involving an over-powered stuntcar and an over-sized pogo stick and is guaranteed to leave you wanting more. The show is very visual and can be performed in English or German. Quirky, funny and irreverent, Ernest, can provide a unique 5,10 or 20 minute set for cabaret stages. 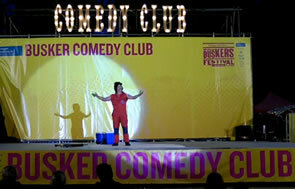 Watch Ernest on the Comedy Club Stage at the World Buskers Festival here. Ernest's show can be tailored to suit a variety of different themes or corporate and product related events. Contact Julian to discuss how Ernest can create a unique stunt routine involving your idea or product. The only car themed comedy show of its type in the world, Ernest's Motor Show is perfect for any Auto-Industry event, Ernest has made appearances in V8 Supercar events, car races and vintage car rallies. Watch Ernest's Motor Show Promo here.